Sunrise Toyota presented four Baby Resusci Anne CPR training units to the East Islip Fire Department at the dealership on 3984 Sunrise Hwy, Oakdale, NY. Sunrise Toyota shines light on the importance of CPR Training with donation to East Islip Fire Dept. (from left to right) Lieutenant Peter Weber, Senator Tom Croci, Fire Chief Keith Villano, Sunrise Auto Group owner James Berg and Sunrise Auto Group COO Aaron Berg. 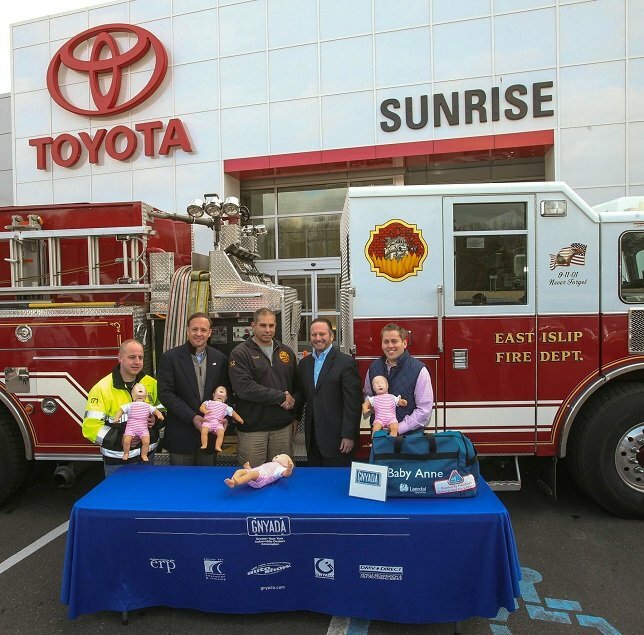 East Islip, NY - January 20, 2016 - Sunrise Toyota presented four Baby Resusci Anne CPR training units to the East Islip Fire Department at the dealership on 3984 Sunrise Hwy, Oakdale, NY. Sunrise Toyota is a member of the Greater New York Automobile Dealers Association which administers the CPR donations on behalf of the National Automobile Dealers Association Charitable Foundation. New York State Senator Tom Croci officiated the event. “It’s a great honor to present the East Islip Fire Department with these life-saving CPR units. They do such an incredible job protecting our community. It’s the least we can do!” said Aaron Berg, Chief Operating Officer, Sunrise Auto Group. “This is another great example of a Long Island automobile dealer supporting the local community,” said Mark Schienberg, president of the Greater New York Automobile Dealers Association. “New car dealers have always had a strong sense of community, sponsoring everything from little leagues, local hospitals, schools, local good causes and international charities and this is no exception,” he continued. The Long Island new and used car dealership has served the Brentwood, Middle Island, Smithtown and New York City area for over 30 years at the same location. With a long and strong relationship tied in with the community, the dealership has invaluable expertise in new and used car sales, service, auto repairs, and Toyota and Scion auto financing and leasing. New-car dealers throughout the country devote much of their time and money to the development or projects that enrich the lives of people in their communities. In cities across the country, tens of thousands of citizens have been taught how to provide CPR on training units donated by new-car dealers because of this program. CPR training units help save lives and give comfort and security to those trained. The donation is part of the National Automobile Dealers Association’s community outreach program. NADA’s program is administered locally by GNYADA. The units allow personnel to train area residents on the correct way to provide cardiopulmonary resuscitation (CPR), allowing those trained to save the lives of countless people who suffer heart attacks and are in need of immediate attention. Nationwide, since 1975, franchised automobile dealers have donated thousands of manikins worth more than $4 million on which more than two million people have been trained. The Greater New York Automobile Dealers Association represents nearly 400 franchised automobile dealerships in the metro New York area that collectively generate billions in economic impact and support nearly 60,000 jobs. The Association represents new car dealers and works to help and inform consumers about the purchasing and servicing options available to them. It also promotes on-going education and training and creates job opportunities for young people interested in pursuing careers in the automotive business. Subject: LongIsland.com - Your Name sent you Article details of "Sunrise Toyota Donates Life-Saving CPR Units to the East Islip Fire Department"